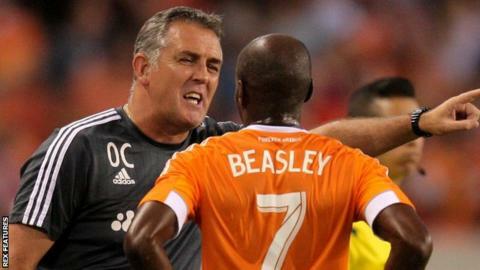 Former Burnley, Bolton and Wigan boss Owen Coyle has left his role as manager of Major League Soccer side Houston Dynamo by mutual consent. The decision was taken with the 49-year-old wanting to be closer to his family in England. Coyle joined in December 2014 on a three-year deal but his side have struggled under his tenure. They did not make the play-offs last year and are currently bottom of the Western Conference. "I asked [club president] Chris [Canetti] if I could speak with him and I explained the challenge of being away from my family," Coyle told the club website. "I'd like to thank the Dynamo supporters, who have been outstanding. We have a brilliant club, and I have no doubt success is just around the corner."